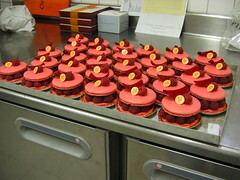 What follows is a special report from Stephanie who has been apprenticing at Pierre Hermé in Paris. She has been there for almost 2 months. We have no idea when she will return. We hope she'll be back soon, but we'd certainly understand if she stayed a while longer. How did she get an apprenticeship at Pierre Hermé? She asked. Some things are simpler than they seem. Having unpaid help was hard for them to refuse, but, for me, it was a chance for a great experience. I started on a Monday morning, with the macaroniers... I have to admit that I was a little disappointed to see that we made thousands of macarons in a few hours--it took away a little of the magic, but fortunately not the taste and quality. Then I went to the lab on Bonaparte and I've been there ever since. 5 weeks now. I've been nicknamed Caribou (and they do mock my accent), or Miss Ispahan... (*see note below) hundreds everyday! But once you get the hang of it, it’s all right. 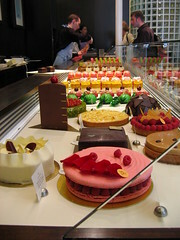 So at Bonaparte, they do the finishing of the cakes, because of the small size of the labs in the heart of St-Germain des Près (I can imagine the rent...), and the chocolaterie is also there. 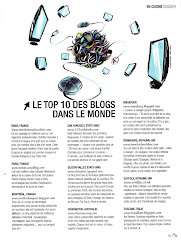 Everything else is done at Vaugirard in the 15th arrondissement, where I will be for the next 4 weeks. Wow, it’s crazy how time flies! So this means that I've been in Paris for 7 weeks now, but I don't feel that I've taken advantage enough of it! Bravo, Steph! 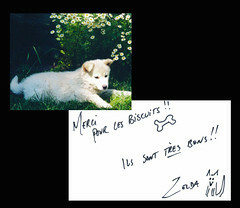 Bon courage et merci pour les photos et nouvelles. And keep knockin' 'em dead! *note* The Ispahan is one of Pierre Hermé's top-selling items and it may very well be his signature patisserie: rose cream, litchis, and raspberries sandwiched between two rose macarons, all of it topped with a rose petal (a real one). Believe the hype. It really is transcendent. His boutique is pretty out of this world, too. It feels more like a high-end jewelry store than a mere patisserie somehow. In any case, the Ispahan makes for a perfect picnic in the Jardin du Luxembourg (speaking of transcendent) nearby. Of course, if you can't wait to savor your Ispahan, the Place St. Sulpice is also rather beautiful and it's even closer. OK, the photo's a little out of focus, but that's only because I was so excited to dig in I could barely contain myself. We'd been wanting to make this dish for several months, ever since we'd come across the recipe (and the mouth-watering photo that accompanied it) in Saveur a while back. At the time it wasn't BBQ season yet, though, so we were forced to hold off. By last Sunday, we couldn't wait any longer. We picked up a couple of flank steaks and some red chiles at Latina, headed over to Park Ave. to pick up some shallots (as well as a few other ingredients for our salsa verde), then rushed home to get to work. The prep couldn't have been easier. We salted and peppered the steaks, then set them aside to sit for 15-20 minutes. I fired up the grill and threw on the red chiles and the shallots (in their skins), keeping them off to the side of the flames so that they wouldn't get overly charred, and grilled them for 15 minutes, until the chiles had turned smoky and sweet and the shallots were cooked through and very tender. Michelle then peeled the shallots, chopped them, and tossed them in olive oil with the chiles while I cooked the steaks. The cooking time on the steaks was pretty quick--about 2-3 minutes per side over a medium fire, depending on the thickness of the steaks. When they were grilled to our liking (rare for me, medium-rare for Michelle), I took them off the heat and let them sit at room temperature for 5 minutes. This method results in a particularly juicy, tasty steak. 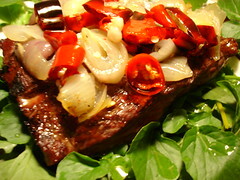 We served the steaks over mixed greens from the garden, and dressed the steaks with the chile and shallot sauce. The finishing touches: guacamole and salsa verde with tortilla chips, and a couple of beers. 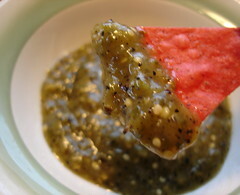 You can make a pretty excellent salsa verde on the stovetop, but the best salsa verde is made with grilled tomatillos. I husked and rinsed 8 tomatillos, brushed them with oil, then grilled them until they were nicely and fairly evenly blackened on the outside (I also grilled a serrano pepper at the same time). I then added them to a blender, along with 2 garlic cloves, about 1 tablespoon of minced white onion, 1/3 cup of cilantro, 1 fresh jalapeno pepper, the grilled serrano pepper, salt, pepper, and lime juice to taste. Like I said, salsa verde off the stovetop is also very satisfying, but nothing beats the smokiness of this grilled tomatillo version. Tomatillos aren't the easiest thing to find in Montreal, but most, if not all, of the Latin American specialty stores carry them and Michelle found the ones we used up at Jean-Talon Market. 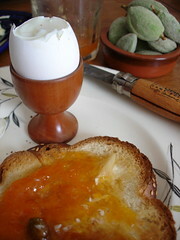 Saturday we went out for breakfast, so we didn't get a chance to give the nougabricot a proper test ride, but Sunday we sat down to a continental breakfast with challah toast, a soft-boiled egg, and the nougabricot. In many ways, an ideal breakfast. As requested, the recipe is now here. We finally made plans to get together with T. and R. for a meal on Saturday morning, and after running down our list of options we decided to check out the brunch at Reservoir. Michelle had been lobbying to go there for quite some time—she’d heard report after report testifying that their brunches were out of this world, and she trusted her sources—but I’d been hesitant to go because I was left unimpressed by a visit there not long after they opened up, months and months ago now. Anyway, we were looking for someplace to go for brunch, we were in the mood to try someplace new—let’s just say things fell into place. I’m glad they did. Our meal there was the most interesting brunch either of us had had in a restaurant in quite some time. Between the four of us we got a pretty full sense of what Reservoir’s menu has to offer. R. kept things light and ordered the yogurt with grilled pineapple, honey, and nuts. Reservoir has two breakfast platters that come without egg dishes and T. tried the one that came with smoked ham, feta cheese, chorizo, a chick pea puree, cornichons, and toast. The ingredients were different, but in terms of approach, this platter reminded me of brunches I’d had in Germany. T. was enthusiastic, to say the least. Michelle and I, on the other hand, tried two of Reservoir’s egg dishes. 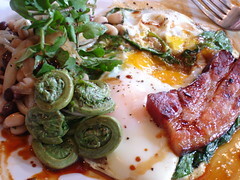 Michelle had the two eggs—one over-easy, one sunny-side-up—with fiddleheads (what a brilliant idea! ), lard fumé, and white bean salad [trust me, the picture above doesn’t really do it justice—Michelle had already started to dig in at the time it was taken], while I had the frittata with braised parsnips, and both dishes were fantastic. The prices run a little bit higher than a lot of other breakfast spots in Montreal (our egg dishes were $10-12 range, while one dish featuring New Brunswick smoked salmon and blinis ran about $15), but it was absolutely worth it. Fiddleheads season is almost over, so you might want to go there soon. This week we’ve been focusing on the flavors on our doorstep. It’s not that we’re getting lazy or something. Far from it. It’s just that sometimes the things that are closest at hand get overlooked. a) Our “local” (our local dépanneur, or corner store) is Épicerie et Boucherie Sa & Fils at the corner of Villeneuve and St.-Urbain. We’re actually lucky enough to have two dépanneurs just half a block away, and, truth be told, Sa is more of a grocery store than a real modern-day dépanneur, but it's definitely our “local.” We had a bit of an in, because our Portuguese landlords are tight with the Portuguese family that runs Sa, but we’ve felt like part of the extended Sa for a few years now. We do a lot of shopping at Sa, and we’ve been carrying out an informal survey of Montreal’s rotisserie chicken specialists for some time now, but for some reason we’d never tried out one of their rotisserie chickens from Sa. 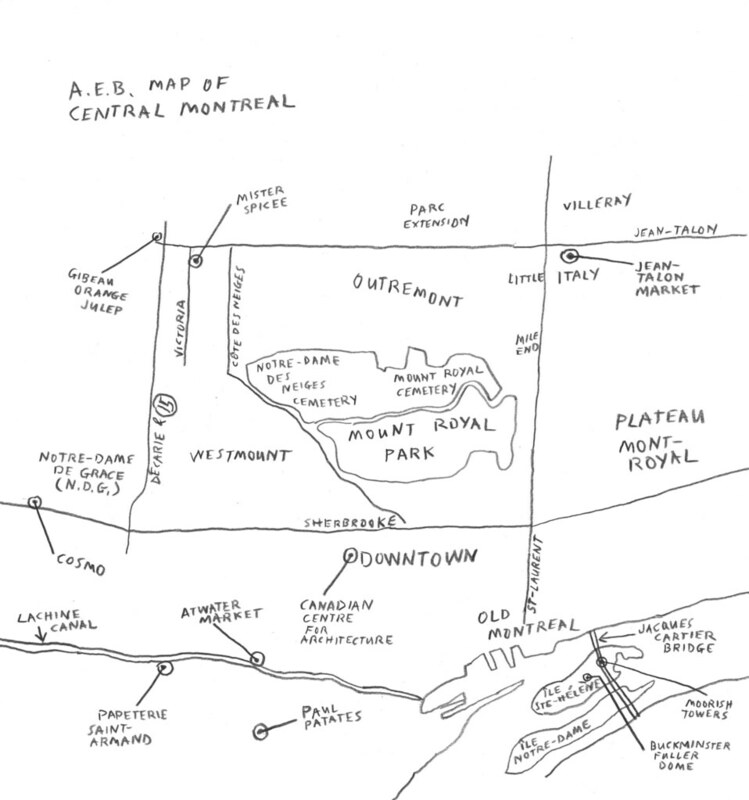 Well, on Monday we finally broke that pattern, picked up a bird and the butcher’s “uncle’s famous hot sauce,” some drinks, some frites from Patati Patata (Sa was out of roasted potatoes) and we descended upon Jeanne-Mance park for a picnic. We were sorry we hadn’t done so earlier. The chicken from Sa wasn’t a grilled, butterfly-style masterpiece like the chickens served up at Rotisserie Portugalia on Rachel, but it was an excellent rotisserie chicken, full-bodied and with a crispy golden skin, and at $6.99 a chicken (their special price on Mondays) it was a steal, too. How was the hot sauce, you ask? Lethal. [Back in the day, my friend Mark got in the habit of using the adjective "brutal" to describe things both positive and negative. You can imagine the confusion this might have caused. After a while, we began asking him to clarify. "Brutal-good, or brutal-bad?" The "famous hot sauce" was lethal-good.] You should have seen how our picnic made heads turn at the park. b) Given the huge number of Portuguese families that live in our immediate area, this district doesn’t have a whole lot of Portuguese restaurants. There are plenty of Portuguese corner stores, grocery stores, bakeries, and fish mongers, but the bulk of the Portuguese restaurants are further south in the Plateau, along St. Laurent, and dotting the arteries and side streets that shoot off from the Main. 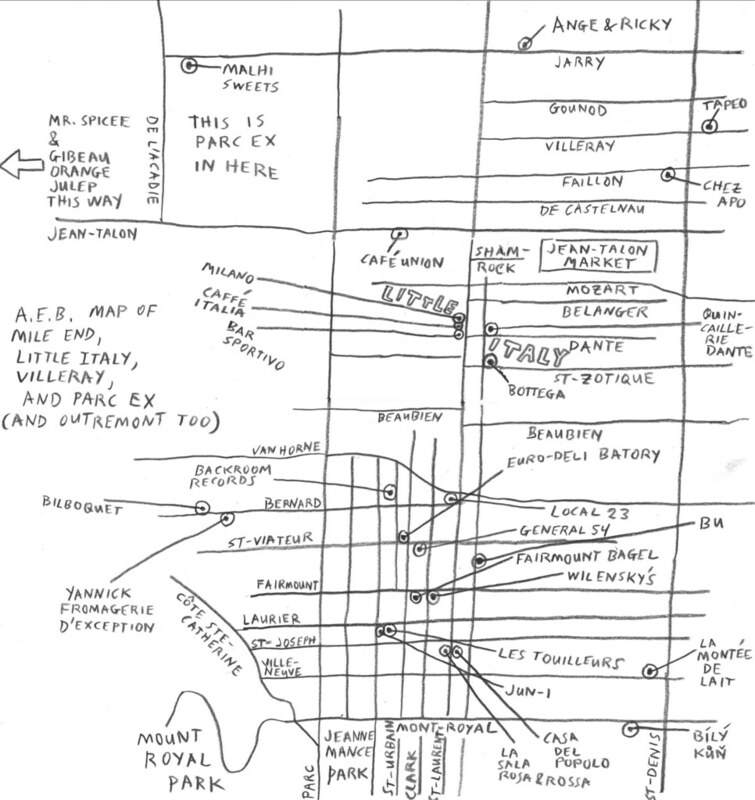 Much of the reason for this has to do with the fact that St. Laurent above Mont-Royal and below Laurier was something of a dead zone until not too long ago. That’s all changed, of course. In any case, about two years ago Marilou opened up on the corner of Villeneuve and St. Laurent. We’ve been meaning to check it out ever since it opened, and I’ve taken a good, long look at the menu a number of times, but for some reason neither of us had actually ever sat down down there for a meal until I went there earlier this evening with some friends. 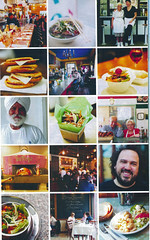 Like so many of the other Portuguese restaurants in town, the grill is where all the magic happens. The one mistake we made was straying from the grill and ordering the rabbit à la Dijonaise. I’d heard stories of legendary grilled rabbit elsewhere in the quartier, so I had visions of something along those lines. Instead, the rabbit came in the form of a couple of lightly breaded cutlets, served with a thick and tasty cognac and mustard-based sauce, and it was good, but it didn’t shine like the grilled delicacies we ordered. Perhaps the standout of the night was the grilled calamari we had as an appetizer. Ever since I had grilled calamari a few years ago, I’ve found it hard to go back to the deep-fried variety that is the norm. If you need convincing, look no further. Marilou’s grilled calamari come whole, drizzled with olive oil, topped with sautéed peppers, and served on a bed of salad, and they were simply amazing, fresh and grilled to perfection. The mixed grill platter came with steak, lamb, pork, and sausage, plus a salad that tried in vain to balance this plate’s overwhelming meatiness—of these, the steak and the sausage were the highlights. The fish of the day special gave you a choice of grilled salmon, tuna, swordfish, or red snapper. We ordered the tuna rosé—the waiter told he wouldn’t serve it to us any other way, actually—and the portion that arrived was very substantial indeed, but we found it a bit too medium-rare for our liking. 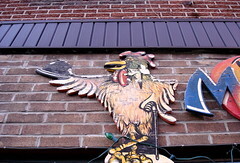 Then there’s the chicken, which might very well be the best deal in the house at $9.50. Like so much of the Portuguese population in this part of town, the owners of Marilou hail from the islands--Madeira and the Azores. 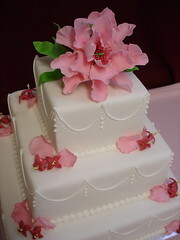 The style is relaxed, informal, and the portions are extremely generous, rustic. If you still have room for dessert, the flan is the way to go. Have it with an espresso. 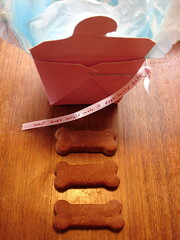 Yes, Michelle's homemade dog biscuits now come dog-approved. When we started this blog we talked about exercising the freedom to cover virtually any aspect of food culture, but dog food? Yesterday's dog show got rained out. I took that as a sign. So, without any further ado, it's time to head back into the realm of human culinary experience, and who better to help us along that path than Amanda Hesser? When I got home last night, I found Michelle all ready to prepare a lovely seafood meal. She'd gone up to Nouveau Falero, picked up a beautiful 2 1/2 pound whole striped bass and was ready to prepare Hesser's recipe for Striped Bass and Fennel from The Cook and the Gardener: A Year of Recipes and Writings from the French Countryside. As much as I love some of Montreal's seafood restaurants, as well as some of the seafood dishes offered by the city's better bistros, let's face it, quality seafood comes at a price in this town. In the summer, though, when we've got our gas grill going, it's pretty easy to match the work of the city's grilled fish specialists--places like Milos and Lezvos--and not only does it cost a lot less, but you can experiment with flavors that you won't necessarily find on the town. A case in point: Striped Bass and Fennel. Brush oil on the cooking rack, then heat your grill. A medium-low flame is ideal for this dish. You should place your rack 5-6 inches from your heat source. Rinse your prepared fish in cool water then pat it dry with paper towels. Cut 5 slits in each side of the fish, 1/2 inch deep. Place a lemon slice and a fennel sprig into each of these slits. Stuff the stomach cavity with the remaining fennel sprigs. Brush the fish with olive oil, then season with salt. 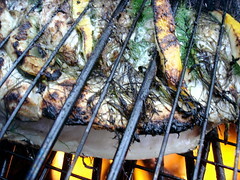 Place the fish on the heated grill over medium-low flames for 5 to 7 minutes per side. (We used a grilling cage to facilitate flipping the fish and in order to help keep the fish, the lemons, and the fennel sprigs in one package.) Grill the fish until it is well browned. Squeeze lemon juice from the lemon half as you're grilling. The fish is ready when its flesh is opaque and no longer translucent. Transfer the fish to a serving dish. Sprinkle with olive oil and more juice from the lemon half. Filet the fish at the table, giving each person some fish with lemon and a fennel sprig. We served the fish with a sauteed fennel and currants dish that Michelle borrowed from Les Chèvres, a scalloped potato dish, and a mixed salad from our garden. One of the Basque chefs interviewed by R.W. Apple, Jr. in that article I mentioned earlier this week (see Pintxo) was quoted as saying that lemon is just a mask for poor seafood, and therefore truly fresh grilled fish should never be served with lemon. While there may be something to this statement, striped bass with fennel and lemon is a brilliant combination. The charred fennel is delicious; the charred lemon less so; but the two together infuse the bass with flavors that are delicate and clean, flavors that highlight and accentuate the quality of the fish instead of masking it. Hesser claims that her striped bass dish serves 4--with an extra side dish or two, plus some cheese and bread, it probably could, but it was so delicious that we made quick work of it just the two of us. The annual Montreal Dog Show is taking place tonight in the tiny park at the corner of Rachel and St. Laurent. I ran into Seth last week, who is emcee-ing the event, and told him I would make some biscuits for it. True to my word, I baked up a batch yesterday and wrapped them up in a pink Chinese takeout container. Anthony is currently concerned for my mental health. 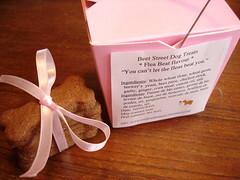 I thought an anti-flea biscuit was a good idea: full of brewer's yeast, garlic, and ginger to make the fleas think twice. I used chicken broth for flavour, beet juice for colour and corn meal for texture. I have been trying all sorts of ways to make Vietnamese coffee ice cream without completely modifying the simple recipe: strong coffee + sweetened condensed milk. All of my efforts have ended up with granité, which has been delicious, but not the point. I wrongly supposed that condensed milk was closer to cream than milk, and found out it didn't have enough fat to stay creamy. I could always make an anglaise-based version, I guess, but then why not call it coffee ice cream? As you can see from the picture above, I buckled under the pressure and bought the thing. 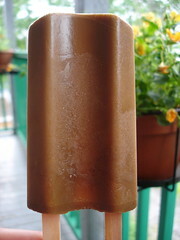 I filled them with Vietnamese coffee and froze them solid. Perfect pick-me-ups on a summer's day. I have been slow to get on the rhubarb train this season. I'd been seeing bunches of rhubarb at the market for the last few weeks, but hesitated each time. Just last week, though, I finally found the perfect bunch: young, firm and pink. I have nothing against green rhubarb, in fact, I prefer it from time to time. 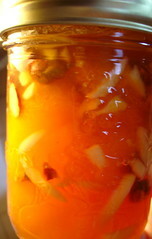 The only thing is, when canning green rhubarb tends to look more like the vegetable it is. Never Mind the Biosphere, Here's the Gibeau Orange Julep! Few things bring back memories of the 1970s for me like an orange julep. Going out for an orange julep was among our rituals when we traveled to Florida from Ottawa to visit my grandparents back in the day. We generally went down to Florida to escape Ottawa’s long, bleak winters for a spell, and orange juleps were one of the tastes I associated with the warmth, the sun, and the ocean. Orange juleps are also among the flavors that seemed to have gone into hiding or even disappeared completely from the map soon after the arrival of the 1980s, along with things like Ovaltine and Carvel ice cream. Few things are as integral a part of summer in Montreal than Gibeau Orange Julep. An iconic part of the Montreal cityscape since the 1940s, the massive orange globe that houses Gibeau Orange Julep was built by Hermas Gibeau and was intended to house him and his family above his already successful roadside drive-in. Then as now, the orange julep was both tasty and good for you, chock full of vitamin C, supposedly fat-free, and loaded with enough carbohydrates to make all those Atkins types run screaming. These days one gets the impression that the top 80% of the structure is a massive holding tank for the frothy orange beverage that shoots down from the ceiling of the restaurant through clear tubes, into a dispenser, and then into your cup. There’s something almost vintage sci-fi about the whole set up. In any case, that big ole orange has a way of lifting one’s spirits when temperatures are chillier—and its surreal dimensions also liven up the otherwise god-awful Décarie expressway—but during the summertime it becomes a full-fledged hang-out, a 24-hour social scene that draws Montrealers from all walks of life to grab a hot dog, fries, and a frosty orange julep, beat the heat, and occupy a location that’s become a postmodern wasteland. Wednesday nights, in a nod to the car culture that gave birth to the Gibeau Orange Julep, local hot-rodders descend upon the premises to show off their wheels. Go ahead: adjust your pompadour, throw on your bobby-sox and make the scene. So, Wednesday night I had the pleasure of accompanying some friends to Pintxo, a recently opened restaurant on Roy, right in the heart of the Plateau. There’s no question New Spanish cuisine is very hot right now. The number of articles I’ve come across in the last year or so that detail Spain’s regional cuisines and the crop of bright chefs, young and old, who are busy reinventing and reinvigorating the Spanish culinary scene right now has been staggering. One of the regions that’s attracted the most attention is Spain’s Basque country, and the best article I’ve read on New Basque cuisine was one by R.W. Apple, Jr. in a May 2004 issue of the New York Times. There, Apple discusses everything from the impact of Juan Mari Arzak, “the founding father of modern Spanish cuisine,” to the virtuoso grilling he discovers in the mountains between Bilbao and San Sebastian, but one of the most interesting sections is the one where he details the elaborate rituals involved in going out for pintxos (a word which is the Basque equivalent to tapas) in San Sebastian. These include the accompaniment of your cuadrilla--a large group of friends (up to 20) with whom you’ll remain loyal throughout most, if not all, of your adult life—a circuit of some 10-15 stops, and a limit of one drink and only one or two pintxos per stop. Modern-day Basque pintxos include everything from classics like “the Gilda,” which combines medium-hot guindilla peppers, olives, and briny anchovies, an ensemble that was said to be as spicy as the Rita Hayworth film of the same name, to what Apple calls “creative pintxos.” Pintxos have been a mainstay of Basque culture for ages, but the emergence of the “creative pintxos” has been something of a phenomenon, encouraging former 3-star chefs to drop-out of the high-end restaurant scene and to show off their eye for detail as pintxo chefs, and introducing many new ingredients, many new flavors to the Basque palate along the way. 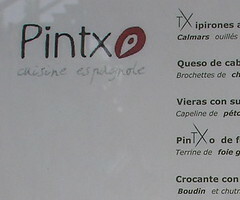 And it’s this “creative pintxos” scene that is the inspiration behind Pintxo here in Montreal. Because of the prices—$3-$4 per dish—we asked our waiter if the pintxos they had on offer were the size of typical tapas dishes. He specified that these dishes were more like amuses bouches and really only amounted to a “bite.” He was right, they were smaller than most tapas dishes I’ve had in Montreal, but, oh!, what lovely little bites they were. The flavors came at us in intriguing combinations, and, for the most part, each of these pintxos was created with the artistry and attention to detail of fine sushi. We ordered quite a few of the 11 pintxos on the menu, and we found it easy to share most of these items between the three of us. Each of our bites was small, but tasty. Our selections included txipirones a lo pelayo (calamari with oignons confits), vieras con su txapela (pan seared scallops with roe), and txampis relleno como me enseño Arzak (mushrooms stuffed with duck confit served in a manner that apparently was learned from Arzak himself). My favorites, though, were the Bonito en cama de pisto (a piece of tuna served rosé on a bed of ratatouille), the tartar de salmon del rio Bidasosa (a delicately spicy terrine of salmon), and the Pintxo de foie con su cebolla confitada (a wonderful dish made with foie gras, oignons confits, nuts, and fruit). The only selection we made that was disappointing was their Alcatxofas con Jamon Serrano (stewed artichoke hearts with bits of ham), a dish which seemed promising but in fact was uninspired. One of the things that Apple makes quite clear in his article is that while there exists no hostility between the high-end restaurants and those that specialize in pintxos (as proof, he notes that Arzak handed him a list of his favorite pintxos houses completely by surprise as Apple was leaving his 3-star restaurant), restaurants don’t try to specialize in both. It was somewhat unsurprising, therefore, that Pintxo’s main dishes, while good, didn’t really live up to the expectations created by their pintxos. My recommendation: bring your cuadrilla and stick to Pintxo’s strong suit, their lovely pintxos, then make good use of their excellent wine list. "There is a God"? Yes, because a) I was shocked that I actually got to cook some of Michelle's fresh peas this time around, and b) this pasta dish was so damn good. OK, so we adapted this recipe from Deborah Madison's The Savory Way, a cookbook that I'm just getting to know, but which I'm already very impressed by. Madison's recipe actually includes the recipe for the pasta, too, but we went ahead and bought some Barilla farfalle to save time, and the dish turned out fantastically just the same. I'm sure it would have been even better with fresh pasta, but, trust me, this version, with freshly shelled peas, the delicate flavor of sautéed leek, and the warmth of the saffron, was more than adequate. Put water on for the pasta. Melt the butter in a large pot. Add the ground saffron and stir. Add the leeks and sauté over medium heat until tender, about 10-20 minutes, adding a splash of wine to help steam them along. Salt and pepper to taste. Cook your pasta until al dente, then drain and set aside. 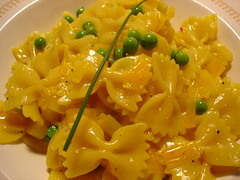 While the pasta is cooking, add the peas and the basil to the leek mixture, as well as another splash of white wine. Cook until the peas are just tender, about 3-5 minutes. Toss the pasta with the pea and leek mixture, mixing them together well. Add a about 1/4 cup of grated Parmagiano and toss once more. Serve in a shallow bowl, with a bit of extra grated Parmagiano sprinkled on top. Serves 4 as a main dish, or 6 as an entrée. Believe it or not, the peas are almost gone. I have had the crate for 2 days, eaten an insane amount of them raw, eaten them for dinner, passed on a bagful to my mom, shelled a few for the freezer, and finally, this morning, I felt the first pangs of a stomach ache. 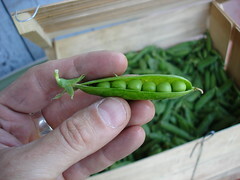 With these pangs comes peace, for I can now assure myself that I took full advantage of the too short pea season, that I lived life to the fullest, that I have won. Yes, after weeks and weeks of failed plans and missed opportunities--none of which was helped by the sudden and untimely demise of Niu Kee--we finally got a chance to celebrate Kazi's birthday on Sunday. Michelle whipped up a lovely Pissaladière a la Niçoise (see above and below), Hermine brought a fresh and tasty Bourgogne Aligoté, and we descended upon a tiny little park on the edge of Mile End for an apero and appetizer picnic/get-together/birthday party. 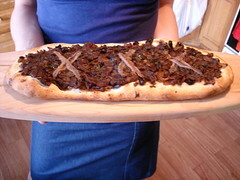 Pissaladière is a Niçois specialty that features caramelized onions, black olives, anchovies, and herbs on a thin crust pizza-like dough. Michelle had never had it before, but that didn't stop her from experimenting, and everyone was glad she did because it turned out amazingly. She made two slightly different kinds. Everyone's favorite was the one with a bit of fennel seed added to it--it cut the brininess of the anchovies and even provided a hint of sweetness. We used a recipe from Cook's Illustrated and it worked like a charm. Heat the oil in a 12-inch nonstick skillet over high heat it shimmers but hasn't started to smoke yet. Stir in the onions, salt, and brown sugar and cook, stirring constantly, until the moisture from the onions has been evaporated, and the onions have begun to brown, about 10 minutes. Reduce the heat to medium-low and cook, stirring frequently, until the onions have softened and are medium golden brown, about 20 minutes longer. Remove pan from heat and stir in water. Transfer to a bowl and set aside. For the life of me, I can't figure out why it's so rare that one finds Pissaladière outside of Nice (well, outside of France, at least). When I start my very own pizza truck complete with wood-burning oven Pissaladière will definitely be one of the offerings. Mix dry ingredients, add oil and water and mix until a ball forms. Let rise 1 hour. Divide in two, shape into balls and let rise 10 min. Stretch dough out into long ovals, brush with oil, add toppings and bake. Serve with a salad (preferably one with greens fresh out of the garden) and wine. Our Montreal Food Guide is now reachable via our sidebar, so you don't have to go digging through our archives to find it. 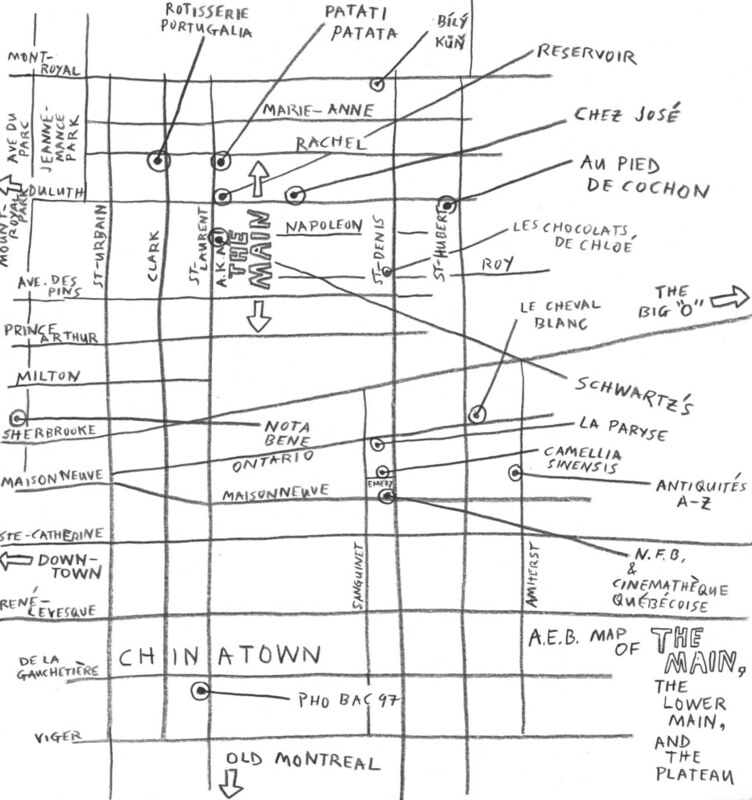 You'll find both the A-M half and the N-Z half under a heading that reads "City Guides." 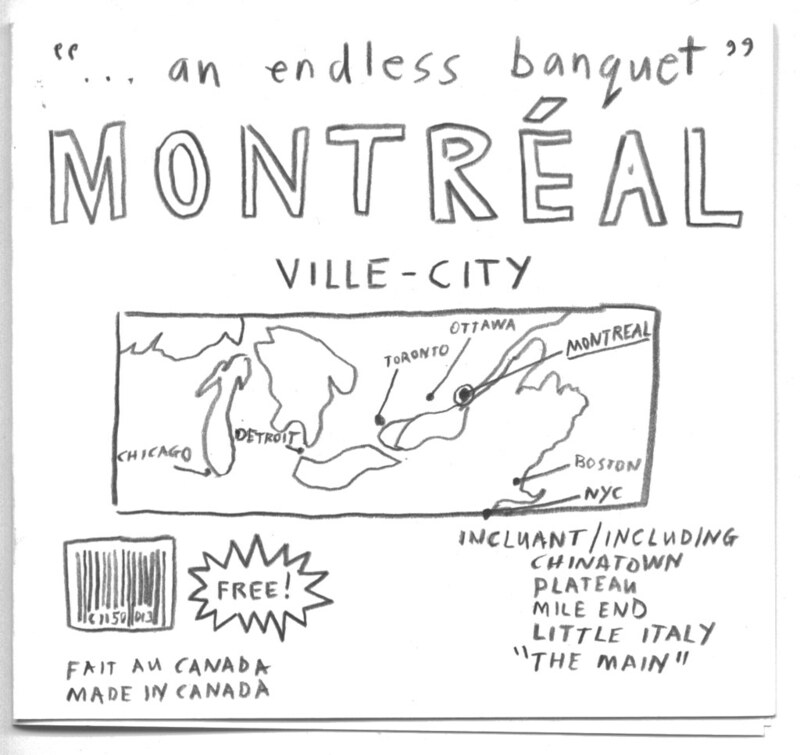 As this heading suggests, the Montreal Food Guide is the first of a number of food guides that we'll be posting on "...an endless banquet" over the next few months. Stay tuned for food guides to New York, San Francisco, Paris, Toronto, et cetera, et cetera... And if you have any hot tips for any of these cities (or for Montreal, for that matter), send 'em along and we'll try to check out as many as we can as soon as we can. Our first salad composed entirely of things from our garden is a sign of good things to come. Some of the plants are still babies, so I was careful not to take too many leaves from any one plant. May they grow to be strong and productive. I predict this will be the salad of Summer 2005. 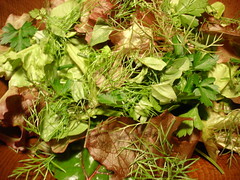 It is composed of red and green oak leaf lettuce, arugula, watercress, swiss chard, green and bronze fennel, basil, chervil, parsley, chives, and tarragon. The bronze fennel was the standout. I love fennel, both the bulbs and fronds, and the bronze version made the green one seem tasteless. 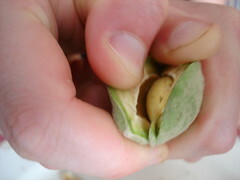 This autumn, I will save the seeds and grow it in profusion next year. Both the arugula and the watercress were delightfully strong in flavour. I'm going to have to plant successive sowings in the next few weeks to keep us in greens. We dressed it with olive oil and balsamic vinegar and ate it in under one minute. Highly recommended. Wow, after a rather phenomenal April, followed by a somewhat lackluster May (that's putting it mildly), June has come in like a true tiger! The sun is out, there isn't a cloud in the sky, and the temperatures are wonderfully toasty here in Montreal. Among other things, this means the streets are hopping, the terraces are packed, there are line-ups out the doors of the city's ice cream shops, and people all across the city are dining al fresco. It also means it's officially time for summer beverages. A week ago I convinced our friend Hermine that it was time to start thinking in terms of gin and tequila, not, say, scotch, in spite of the chilly, soggy, generally miserable weather we were having. I'd like to think the gin and tonics we put away late last week helped drive out the dreariness once and for all. Orangeade is a nice way to usher in the balmy temperatures. Just juice whatever oranges, lemons, and limes you have around the house in whatever ratio suits your tastes, then pour the juice in a large pitcher. Add water to fill up the pitcher. Then sweeten the mixture according to your tastes using the Simple Sugar Syrup recipe below (you'll never encounter that "adding granulated sugar to a cold drink" problem again). 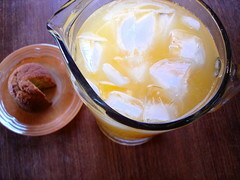 Add a bunch of ice cubes to give the orangeade a nice chill, then serve. A sprig of mint as a garnish is always nice. We served our first orangeade of the season with a small piece of these little Honey-Ginger Pound Cakes Michelle made last night at Les Chèvres. Add ingredients to a saucepan and bring to a boil. Turn the heat down and simmer the mixture for 5 minutes. Let it cool before adding it to your favorite summer drink, be it iced tea, lemonade, orangeade, or whatever. You can keep the remaining syrup in an airtight jar in the refrigerator for your next batch.